MacFamilyTree 7 (MacStammbaum 7 in Germany) is a popular genealogy app developed for the Mac OS X and iOS (iPhone, iPad, iPod touch) platform, that dates back to the late 1990s, when MacFamilyTree version 1.0 ran on 68k Macs (version 1.6 was the first to support PowerPC Macs). It is one of the “cleanest” apps when it comes to iCloud/cross-platform support between your Mac and iOS device, and it fully supports the “Handoff” capabilities of OS X 10.10 “Yosemite”, where you can be working on a person or family on your Mac, and pick up your iPad, and immediately begin working where you left off. MFT has several visualization options, including a “Virtual Globe” that allows you to physically track where your ancestors lived, married, immigrated, etc. If you enable the FamilySearch features, it has extensive built-in support for FamilySearch. 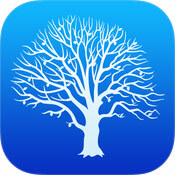 MobileFamilyTree, the iOS companion app for MFT, is a fully-featured genealogy app in its own right. You do not need a desktop or laptop to do your genealogy research using MobileFamilyTree, and it supports sharing GEDCOM files with others (something several of the mobile apps do not). 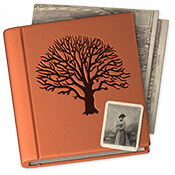 It does offer most of the features of MacFamilyTree, and it’s one of the first true genealogy apps available to iPhone users, with version 1 being released in 2008. OS X 10.10 Yosemite Support: Yes, MFT 7.3 added a new user interface that matches the Yosemite styling. Handoff - easily move between iOS 8 and OS X 10.10 devices. GEDCOM Support: Yes, full support. iCloud/Cloud Support: Yes, includes backing up and/or syncing with other Macs running MFT, or with MobileFamilyTree on a portable iOS device. Online Services Support: FamilySearch.org. You can download FamilySearch information directly into MacFamilyTree, or you can up upload information to share with others (information about living persons is not shared). There are options to allow MFT to try and match persons with FamilySearch in the background. See MFT's FamilySearch Q&A page for more details. 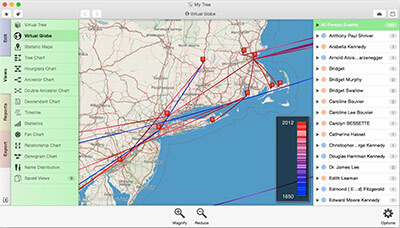 Virtual Globe 2.0 - shows locations where family members lived, immigrated, etc., as well as allowing for a timeline view. Series History: Series History at Synium Software from version 1 (1998) through 7 (current 2015).